The aim of this study was to estimate the prevalence of pneumonia and secondary bacterial infections during the pandemic of influenza A(H1N1)pdm09. 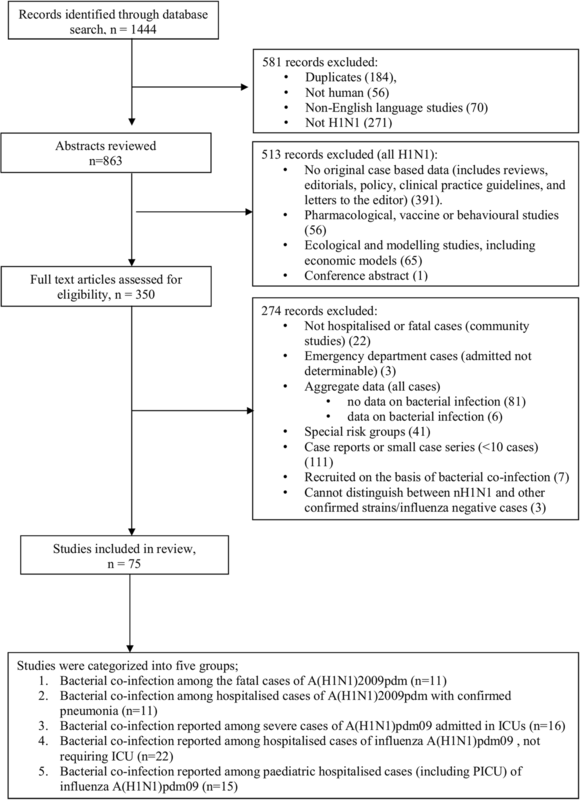 A systematic review was conducted to identify relevant literature in which clinical outcomes of pandemic influenza A(H1N1)pdm09 infection were described. Published studies (between 01/01/2009 and 05/07/2012) describing cases of fatal or hospitalised A(H1N1)pdm09 and including data on bacterial testing or co-infection. Seventy five studies met the inclusion criteria. Fatal cases with autopsy specimen testing were reported in 11 studies, in which any co-infection was identified in 23% of cases (Streptococcus pneumoniae 29%). Eleven studies reported bacterial co-infection among hospitalised cases of A(H1N1)2009pdm with confirmed pneumonia, with a mean of 19% positive for bacteria (Streptococcus pneumoniae 54%). Of 16 studies of intensive care unit (ICU) patients, bacterial co-infection identified in a mean of 19% of cases (Streptococcus pneumoniae 26%). The mean prevalence of bacterial co-infection was 12% in studies of hospitalised patients not requiring ICU (Streptococcus pneumoniae 33%) and 16% in studies of paediatric patients hospitalised in general or pediatric intensive care unit (PICU) wards (Streptococcus pneumoniae 16%). We found that few studies of the 2009 influenza pandemic reported on bacterial complications and testing. Of studies which did report on this, secondary bacterial infection was identified in almost one in four patients, with Streptococcus pneumoniae the most common bacteria identified. Bacterial complications were associated with serious outcomes such as death and admission to intensive care. Prevention and treatment of bacterial secondary infection should be an integral part of pandemic planning, and improved uptake of routine pneumococcal vaccination in adults with an indication may reduce the impact of a pandemic. Influenza pandemics cause morbidity and mortality from both direct viral effects, which tend to present early (within the first few days), and secondary bacterial complications, which tend to present later (after the first week). Evidence of influenza predisposing to bacterial co-infection is seen in seasonal influenza epidemics, past pandemics, pathology studies and animal models [1–8]. Infection with influenza disrupts the respiratory tract by direct pathogenic effects, which then predisposes to bacterial secondary infection. Conversely, bacterial pathogens in the respiratory tract may also predispose to influenza and other viral infection . During the 1918 pandemic, bacterial pneumonia was a major cause of morbidity and mortality, as shown by studies at the time as well as retrospective study of pathology specimens [10, 11]. At that time, antibiotics were not widely available as they are now, and it is thought that the high observed mortality rate was partially due to the inability to treat secondary bacterial sepsis. The most important bacterial co-infections during an influenza pandemic S. pneumoniae, H. influenzae, S. aureus, and group A Streptococcus (1, 4). However, two early reviews of severe cases of 2009 pandemic influenza A (H1N1) showed no evidence of bacterial pneumonia among 30 hospitalized patients with laboratory-confirmed cases in California (5) and 10 intensive-care patients in Michigan (6). These reports might have led to a perception that bacterial co-infections played a limited role or no role in pandemic influenza deaths in 2009. The aim of this study was to estimate the prevalence of pneumonia and secondary bacterial infections during the 2009 pandemic of influenza A(H1N1)pdm09. A systematic review was conducted according to the Preferred Reporting Items for Systematic Reviews (PRISMA) .We sought primary studies that presented quantitative data of invasive bacterial co-infection in influenza A(H1N1)pdm09 patients, defined as isolation of a bacterial pathogen from a sterile site. Databases searched included Medline, Pre-Medline, EmBASE and LILACS. The search strategy included a combination of Medical Subject Headings (MeSH) and text words to improve the identification of relevant publications in which bacterial co-infection was not necessarily the primary outcome of interest. The World Health Organisation (WHO) advised on the use of the standardised nomenclature influenza A(H1N1)pdm09 in October 2011 . Prior to this time, various names were used to describe the pandemic virus. As such, a broad search strategy was developed to identify relevant literature in which clinical outcomes of influenza A(H1N1)pdm09 infection were described. The Medline search included a combination of two searches. The first included the MeSH term influenza A H1N1 subtype OR text words influenza or flu adjacent to H1N1/pandemic/swine AND the MeSH term bacterial infections OR text words bacteria*, streptococcus, pneumococcus or staphylococcus adjacent to pneumonia, secondary, infection or evidence. The second search strategy included the influenza search terms and a combination of severity terms including fatal, severe, death, mortality, morbidity, hospitalisation, critical and admitted. The same search terms were applied to the other databases, after ensuring the MeSH terms of the relevant search terms were consistent across databases. Searches were limited to human studies, published in the English language between 01/01/2009 and 05/07/2012 or accessible online, ahead of print within this timeframe. Hand-searching of the reference lists of included studies and relevant reviews were also undertaken to identify other relevant papers. We included all studies of influenza A(H1N1)pdm09 which report bacterial infections (any sterile site) in influenza A(H1N1)pdm09 cases. Studies including only specific at-risk populations such as transplant or oncology patients or pregnant women were excluded. We included published English language papers of observational studies reporting on ≥10 influenza A(H1N1)pdm09 patients. Case reports and small case series of < 10 patients were also excluded. Included cases were either fatal or hospitalised cases of confirmed or probable influenza A(H1N1)pdm09 confirmed by PCR or culture. Probable cases (13/75 studies) included those with positive influenza A serology during 2009–2010, but not testing of subtype. However, studies which included a mixed cohort of influenza A(H1N1)pdm09 and other laboratory-confirmed influenza strains or influenza negative cases were only included if clinical outcomes could be distinguished between influenza A(H1N1)pdm09 and other confirmed strains. We excluded studies which described ambulatory influenza A(H1N1)pdm09 cases, including notifications, clinic visits or Emergency Department visits with no sub-group analysis in which hospital admission or death of patients was described. For included studies, the definition of co-infection was broad and included any study reporting either pulmonary infection or site unspecified with or without data on bacterial type tested, or specimen tested, including those reporting negative findings. We excluded studies reporting suspected bacterial pneumonia on the basis of clinical findings alone and studies which tested specimens for presence of co-infection with respiratory viruses only. Studies reporting contamination of endotracheal tubes only and those in which patients were recruited on the basis of bacterial infection were excluded if no data on other results were reported. We present the number of cases of reported pneumonia and those requiring mechanical ventilation as per the investigators definition. Five reviewers (AH, MB, RT, IR,, HS,) with experience in conducting systematic reviews independently reviewed the titles and abstracts to identify potentially relevant papers. All potentially relevant papers were read by two reviewers (AH, MB) to determine those which met the selection criteria. The results of the search strategy are shown in Fig. 1. An identical data extraction template was used by all reviewers to extract the clinical outcomes, diagnostic data and treatment. Clinical outcomes included the diagnosis of bacterial co-infection, pneumonia, and death. Treatment included mechanical ventilation and use of antibiotics. Diagnostic data included determination of pneumonia and bacterial testing. We also extracted methodological details of the relevant studies including study design, study location and methods of case ascertainment. To ensure consistency in data extraction, each study was independently data extracted by two reviewers. All findings, including discrepancies between reviewers were discussed with an independent senior reviewer (CRM). We report bacterial findings separately from pulmonary specimens when available. When site of specimen is not specified or combined, this is reported as such. We report the percentage of tested cases positive for bacteria when available. The variability of the available data precluded the aggregation of results in a quantitative meta-analysis. Results of the studies are summarised and a critically evaluation and interpretation provided. We present results separately for fatal cases, hospitalised cases with confirmed pneumonia, cases admitted to intensive care units (ICU) and hospitalised cases admitted to general wards including criteria for admission if reported. Pneumonia, hospital admission and ICU admission were accepted according to classification in the reviewed papers. A total of 7845 studies were identified on the 2009 pandemic, of which 1444 articles were initially identified from our search of studies potentially about both influenza A(H1N1)pdm09 and bacterial infection. After removal of duplicates, non-human, non-English language, and non-influenza A(H1N1)pdm09 studies, 863 articles remained and abstracts were reviewed. Of those, 350 full papers were reviewed for relevance and 75 studies met the inclusion criteria. The PRISMA diagram of the study selection is shown in Fig. 1. Reporting of patient clinical outcomes, bacterial testing and bacterial findings varied widely in the included published studies. It was not clear in many studies if pneumonia was community or hospital acquired. The studies also varied in their methodologies and proportion of patients tested, as well as reporting of bacterial testing. Samples and time of sampling were not adequately described in most of the studies. Eleven studies were on fatal cases, including eight reporting autopsy results and three studies reporting bacterial findings from medical record reviews of notified deaths of confirmed influenza A(H1N1)pdm09. The remaining studies reported bacterial findings from hospitalised cases. 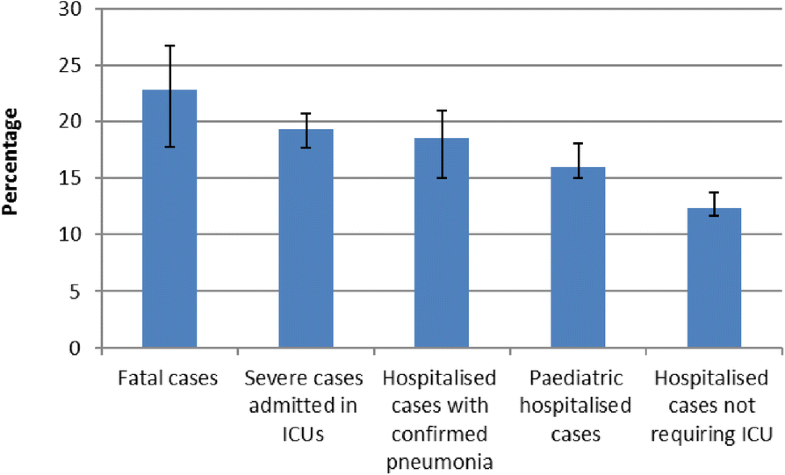 Figure 2 shows the average prevalence of bacterial infection in fatal, ICU admitted, general ward admitted and paediatric patients. Eleven studies reported evidence of bacterial co-infection of fatal confirmed cases of influenza A(H1N1)pdm09 occurring between April 2009 and May 2010 [1, 2, 14–22]. Eight studies reported autopsy results, including 8 autopsy case series [1, 2, 16–19, 21, 22] and 3 reporting bacterial findings from medical records reviews only [14, 15, 20]. Five studies were based in the USA [1, 2, 15, 16, 18] while the others were from Mexico , Estonia , Brazil , the United Kingdom , Korea  and Japan . Influenza A(H1N1)pdm09 infection was confirmed by reverse transcriptase polymerase chain reaction (rtPCR) in either ante-mortem nasopharyngeal swab or post-mortem lung tissue specimens for all cases in all studies. Case definitions for an included fatal case reflected national surveillance reporting and/or autopsy requirements during the pandemic period and enhanced surveillance for the identification of fatal cases included the review of the death certificate registries for influenza as a cause of death. The study details, bacterial testing and bacterial findings are summarised in Table 1. Where data were available, 44–100% of cases were hospitalised before death, including 55–100% in ICUs, with 35–100% requiring mechanical ventilation support during their hospitalisation and 25–94% of patients with clinical and/or autopsy evidence of pneumonia (viral or bacterial). From chart reviews, positive bacterial growth ranged from 2 to 38% (mean bacterial 23%)  of autopsied cases. Of the total coinfection cases, 29% were Streptococcus pneumoniae. The overall rate of bacterial infection was significantly higher in fatal cases compared to nonfatal cases (OR 1.71, 95% CI 1.33 to 2.20). The Korean study of standardised case reports of A(H1N1)pdm09-associated deaths identified during a period of active surveillance estimated ILI case-fatality rate to be 16 per 100,000 cases . Enhanced surveillance/confirmed cases in New York City. 21/28 with abnormal CXR and multilobar infiltrates. 18/33 (54.4) have evidence of bacterial co-infection by tissue Gram stain. 16/33 (55) have evidence of bacterial co-infection by tissue Gram stain morphologically compatible with streptococcus. Multicenter (15), case series, Tokyo. The lowest proportion of co-infection was reported in the first 100 confirmed deaths in Mexico  where 94% of patients had multiple foci of pneumonia (based on imaging) and 84% required mechanical ventilation, and only 2 cases had positive bacterial cultures (Staphylococcus epidermidis and Staphylococcus hominis). Of the eight autopsy case series, 3 studies tested lung tissue specimens for evidence of bacterial infection in all included subjects [16–18] and identified bacterial co-infection diagnosed either before or after death in between 29 and 43% of fatal cases [16–18]. The highest proportion of culture positive bacterial co-infection from autopsy samples (38%) was reported by Tamme . The reported post-mortem bacteriologic samples included culture, immunohistochemistry and PCR. No studies gave a complete picture of pulmonary bacterial co-infection during the clinical course and corresponding post-mortem findings. Bacterial co-infection identified prior to death was identified from clinically driven testing and no studies had a standardised testing protocol for all included fatal cases. On this basis, bacterial infection complicating A(H1N1)pdm09 ranged from 5 to 14% of fatal cases in the four studies [1, 17, 21, 22] reporting data from clinical testing prior to death (Table 1). Specimens obtained included sputum, bronchial aspirates and bronchoalveolar lavage, but no studies reported details of testing conducted prior to death, including the proportion tested, or the types of bacteria tested for. Eleven studies reported on influenza A(H1N1)pdm09 among hospitalised cases with evidence of pneumonia and are summarised in Table 2. Pneumonia was largely defined based on radiological findings in these studies. Any positive bacterial testing was reported in 9/11 studies and positive bacterial growth was ranged from 0 to 47% (mean 19%). Streptococcus pneumoniae was the most commonly isolated pathogen (54%). In these 9 studies, Acinobacter baumanii was the next most commonly identified bacteria (5–21%), followed by MRSA (3–6%), S. pneumoniae (2–4%) and K. Pneumonia in (1–8%). Of the 11 studies, 2 reported no evidence of bacterial co-infection in their cohort of patients [4, 23], however, neither reported the proportion of patients tested. The study conducted in Mexico early in the pandemic  isolated ventilator-associated bacteria in 4 (22%) cases, with Acinetobacter baumannii, Achromobacter xylosoxidans, methicillin-resistant Staphylococcus aureus, and Escherichia coli identified. New pulmonary infiltrates consistent with pneumonia, compatible clinical presentations. Identification of clinicalyl significant bacteria in respiratory secretion or specimens from sterile compartments was recorded as secondary bacterial infection. Blood cultures (BC) - Any patient with high fever > 38.0 °C for ≥3 days or repeated fever. Sputum cultures (SC) - patients with symptoms of expectoration especially with yellowish/purulent sputum. Definition: the presence of an infiltrate on plain chest radiograph. Pre-treatment BC, SC, and urinary Ag for S. pneumoniae and Legionella sp. Six studies reported use of antibiotics prior to specimen collection in subjects with bacterial co-infection in 21–22% of those tested [23, 24]. One study reported factors associated with acute respiratory distress syndrome (ARDS) or death, with the ARDS-death group more likely to have bacterial co-infections than patients who survived without ARDS or had mild disease . Specimens included sputum, bronchial aspirate, pleural fluid, urine and blood with testing mainly being bacterial culture, but also multiplex PCR assay for respiratory bacterial panels (for detection of Legionella pneumophila, Chlamydophila pneumoniae, and Mycoplasma pneumoniae) and Binax NOW, an in vitro immunochromatographic assay for Streptococcus pneumonia. However, the mPCR assay did not test for S. pneumoniae in one study and the authors could not report the presence of this organism . Sixteen studies reported on influenza A(H1N1)pdm09 cases admitted to ICU wards and are summarised in Table 3. Criteria for admission to ICU varied in the included studies, including acute respiratory distress (ARD) [26, 27], acute respiratory failure [28, 29], required mechanical ventilation (MV) [5, 30, 31] or MV or low O2/IV vasoconstrictive drugs [32, 33], MV or ECMO  or admitted with no criteria provided [35–41]. Eleven studies included only PCR confirmed A(H1N1)pdm09 cases, while three included probable cases [31, 39, 40] and another three included both probable and suspected cases [5, 33, 34]. Any positive bacterial testing was reported in 12 studies and bacterial co-infection was identified in 1–43% of cases (mean bacterial 19%, Streptococcus pneumoniae 26%). One study assessed differences in mortality outcomes based on secondary bacterial pneumonia. In a large study involving admissions to 35 ICUs for ILI and ARF requiring mechanical ventilation in Argentina (n = 337), 24% of included patients had bacterial pneumonia on admission, 8% with S. pneumoniae . S.pneumoniae co-infection was associated with higher mortality (OR 2.72 95% CI 1.05–7.06), despite concurrent antibiotic treatment on admission . A Canadian study (N = 168) attributed secondary bacterial infection as a leading cause of death in the 29 (17.3%) fatalities that occurred in this cohort . aeruginosa were also documented in three patients (9.3). Twenty two studies reported on hospitalised influenza A(H1N1)pdm09 cases (not requiring ICU) and are summarised in Table 4. Almost all studies include patients admitted to general wards, however some were transferred to ICU during the course of treatment. Most of the studies (19/22) reported bacteria testing and any positive bacterial growth was reported in 1.6–76% cases (mean bacterial 12%, Streptococcus pneumoniae 33%). The number of patients with S.pneumoniae co-infection varied from 1 to 31% depending on site of sample. Palacios et al. conducted a study in Argentina and bacteria was found in 76% of nasopharyngeal samples (152/199), of which Streptococcus pneumoniae was isolated in 31% (62/199) samples . Fifteen studies reported on admitted paediatric influenza A(H1N1)pdm09 cases, including 11 to any hospital ward and 6 restricted to PICU and are summarised in Table 5. The mean prevalence of bacterial co-infection was 16% in studies of paediatric patients hospitalised in general or pediatric intensive care unit (PICU) wards. Rates of bacterial co-infections vary in these studies, ranging from 0 to 87% (mean 5%) in any hospital ward admission to 13–34% (mean 32%) in admission to PICU. The highest rate was reported by Okada  who conducted a study in Japan on 46 hospitalised children from July 2009 to January 2010. Bacteria were isolated from nasopharyngeal swabs of 87% admitted cases (40/46)- S. pneumoniae 37.0%; S. pneumoniae and H. influenzae 23.9%, H. influenza, 26.1% and S. aureus 23.9%. Single-centre case series (retrospective) / Pneumonia, pharyngitis or bronchitis cases (< 15 years) (n = unclear). Secondary bacterial infection was an important complication of the 2009 influenza pandemic, with almost 1 in 4 severe or fatal cases having bacterial secondary infections, albeit with varying rates. Bacterial infection appeared to be associated with morbidity and mortality, with higher rates in adults, ICU patients and those with a fatal outcome. Streptococcus pneumoniae was the most common bacteria identified, and in ICU patients, ventilator associated pneumonia with organisms such as Acinetobacter baumannii, Achromobacter xylosoxidans, methicillin-resistant Staphylococcus aureus, and Escherichia coli was common. The prevalence of bacterial co-infection was lower in studies of hospitalized patients not requiring ICU and in studies of paediatric hospitalized patients, although the latter was quite varied. The overall morbidity and mortality of the 2009 pandemic varied by country, but was cited as being similar to a severe seasonal influenza epidemic . However, two important differences in the epidemiologic pattern of the 2009 pandemic were firstly, a low average age of death in fatal cases (53 years compared to 83 years during seasonal influenza) and high intensive care unit (ICU) occupancy rates . These two features hint at a severe population impact, and a UK study showed a “w” shaped morbidity curve with a peak in young adults . The 1918 pandemic has served as a reference point in pandemic planning, but availability of antibiotics, critical care and extra-corporeal membrane oxygenation (ECMO) have vastly improved survival during a contemporary pandemic, so it would be unlikely that case fatality rates of 1918 would recur in the modern era . The use of ECMO rose sharply in 2009 and is associated with high rates of survival . Further, in understanding the morbidity and mortality impact of a modern pandemic, it is important to quantify the relative contribution of direct viral effects compared to bacterial secondary infections, as treatment and prevention options are also available for bacterial infections. Testing for bacterial complications during an influenza pandemic is important, but was neglected in most studies which we screened for this review. For optimal response and mitigation of preventable morbidity and mortality, active surveillance during both seasonal and pandemic influenza is necessary, and systems should be in place for rapid assessment of secondary bacterial morbidity and mortality. Diagnosis and treatment of secondary bacterial infections should always be considered during a pandemic . Currently there are limited data on bacterial coinfection during influenza pandemic in 1918. Morens et al. reviewed autopsy data from 58 lung tissue samples collected during the 1918 influenza pandemic and histologic evidence of severe bacterial pneumonia was found in almost all samples . The authors also did a literature search around autopsy case series and examined data of 3074 subjects in 68 high quality autopsy case series. This showed that more than 92% of autopsy lung cultures were positive for at least one bacterium . Another study by Chien et al. reviewed the studies that reported more than 10 sterile-site antemortem cultures from adults with pneumonia during 1918 pandemic . Culture positivity rates among influenza cases without pneumonia was very low (mean < 1%), compare to those with pneumonia (mean, 16%; range, 2 to 50) . Bacterial co-infection rates among hospitalised cases with confirmed pneumonia in this study was 19%, which is comparable to Chien et al. The rate of bacterial co-infection may be underestimated as many cases are not tested for bacterial infections, and bacterial pneumonia cannot always be differentiated from viral pneumonia on the basis of clinical presentation, radiology and routine blood tests. There is also a need to develop diagnostic algorithms for early identification of bacterial infections in these cases to ensure early detection and treatment of bacterial complications. The WHO guidelines on vaccines and antivirals for a pandemic, along with many country-specific pandemic plans, do not consider pneumococcal vaccines . The CAPITA trial shows efficacy of conjugate pneumococcal vaccine against pneumonia , and the polysaccharide vaccine also has efficacy against invasive pneumococcal disease . We have found evidence that severe and fatal cases of influenza during the 2009 pandemic did comprise secondary bacterial causes, including streptococcus pneumoniae as a contributing factor. Vaccination against streptococcus pneumonia is often neglected in pandemic planning , but could have a positive impact on morbidity and mortality. The evidence confirms that prevention of bacterial secondary infection should be an integral part of pandemic planning. Improving uptake of routine pneumococcal vaccination in adults with an indication will cover most patients at risk, and may reduce the impact of a pandemic. To our knowledge, this is the first systematic review to estimate the prevalence of pneumonia and secondary bacterial infections during pandemic influenza A(H1N1)pdm09. We calculated bacterial co-infection rates separately for fatal cases, hospitalised cases with confirmed pneumonia, hospitalised cases admitted to ICU, hospitalised cases admitted to general wards and paediatric hospitalised cases, showing the highest risk of bacterial infection for fatal and ICU admitted cases. We found that secondary bacterial infection was an important complication of the 2009 influenza pandemic, with Streptococcus pneumoniae the most common bacteria identified. Bacterial infection appeared to be associated with morbidity and mortality, with higher rates in adults, ICU patients and those with a fatal outcome. Prevention and treatment of bacterial secondary infection should be an integral part of pandemic planning, and improved uptake of routine pneumococcal vaccination in adults with an indication may reduce the impact of a pandemic. We acknowledge the support of Anthea Katelaris, Anthony Newall and James Wood for some preliminary work on this project. No funding was involved in this study. CRM: lead investigator, conception and design of the study, drafting and manuscript revision; AH, MB, RT, IR, HS: reviewed the titles and abstracts to identify potentially relevant papers; AH, MB: reviewed all potentially relevant papers to determine those which met the selection criteria and conducted literature review, AAC; reviewed and extracted data from selected paper, prepared first draft of manuscript. All authors approved the final version to be submitted. C. Raina MacIntyre has received in-kind support and funding for investigator-driven research from GlaxoSmithKline, Pfizer, Merck, and Seqirus, and has sat on advisory boards for Merck, GlaxoSmithKline and Pfizer. IR: IR has received grant funds for investigator-driven research from GSK, Pfizer and for consultation from Merck. The remaining authors declare that they have no competing interests and have no non-financial interests that may be relevant to the submitted work. Malato L, Llavador V, Marmier E, Youssef J, Balick Weber C, Rozé H, Bessede E, Fleury HJ. Pandemic influenza A(H1N1)2009: molecular characterisation and duration of viral shedding in intensive care patients in Bordeaux, south-west France, May 2009 to January 2010. Euro Surveill. 2011;16(4). Available online: http://www.eurosurveillance.org/ViewArticle.aspx?ArticleId=19776.